No questions asked: this is a legitimate hunting round. 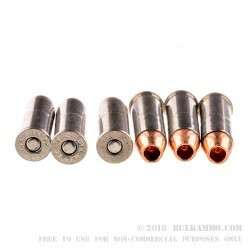 The all copper projectile is a 225 grain powerhouse meant for weight retention, accuracy and consistency in deformation. 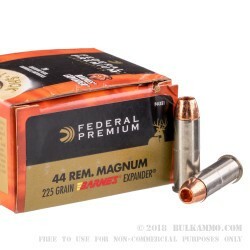 The powder charge and cartridge components are consistent and reliable, and this 44 Mag ammunition is custom built to provide a huge wound channel with a maximum delivery of energy on target. 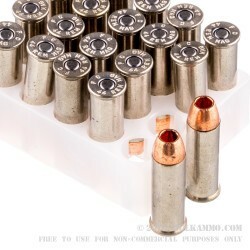 The 1280 feet per second of muzzle velocity translates to a fast, flat shooting bullet that easily stays on target at longer ranges; the 815 ft. lbs. of energy means your target won’t be moving after the bullet arrives to the destination. 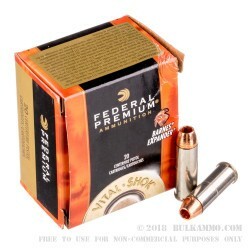 The all copper projectile allows hunting in most of the highly regulated areas and the controlled expansion of this round creates a predictable wound channel with a nearly 100% weight retention on target, meaning you have the most energy delivery and the widest diameter wound channel. The terminal ballistic on this load are beastly. It’s an obvious candidate, given the effect ion large game, for home defense or self-protection for those opting for a .44 magnum firearm. The deep cup means it’s a no brainer in lever action firearms and the high build quality of the nickel plated brass and the clean powders means it’s suitable in any firearm, including very finnicky .44 Magnum autos.